Renovating houses is a time-sensitive job. The housing market is always changing and unless you're paying for the house with cash the longer you hold onto a property the more money you spend. As such, we work on the weekends. 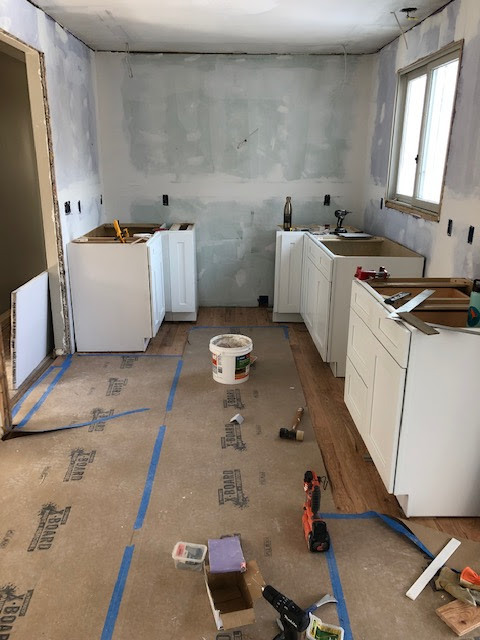 So Saturday I arrived at the house and discovered that my father had installed the floor tile in the bathroom and the kitchen flooring had gone in and the cabinets had been unpacked. We spent all day installing the cabinets and making them all level. I didn't expect such a small kitchen to take so long, especially because there aren't any uppers. Not pictured are the pantry cabinet and the over-the-fridge cabinet which are behind where I'm standing. But now that everything's been installed we're ready for the countertop. So after finishing up on Monday, we headed to the granite store to see what they had for options. In my head I wanted to use the same matte-black countertop we'd used on The Chalet, but unfortunately they no longer stock it. 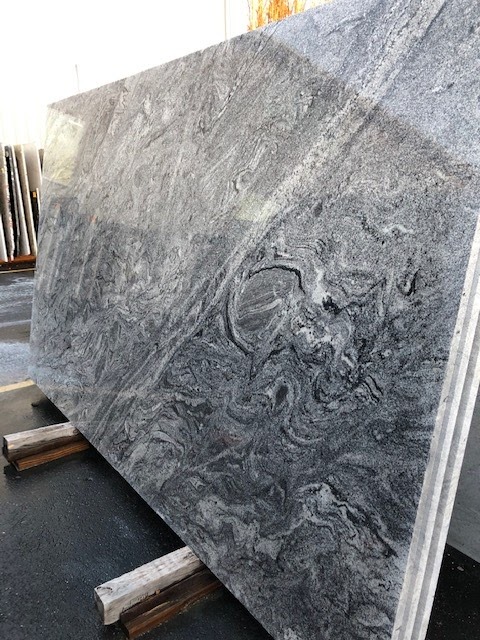 So we took a look at what they currently had available and decided on this slab (above) because of the swirls. None of the other slabs looked like this one and we're selling a one-of-a kind property so it was fitting. I can't wait to see it installed; I think it's going to be a gorgeous kitchen.